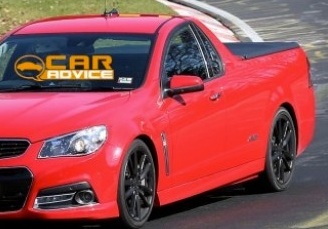 Australia’s CarAdvice caught a completely undisguised Holden VF Commodore SSV ute lapping the famed Nurburgring track in Germany. Sporting a Victorian plate on its tailgate, the Zeta-based car-with-a-bed was undergoing the final round of dynamics testing, and its sighting immediately sparked chatter of the possibility of the freshened Commodore making its way to Europe. Holden confirmed that a Holden engineer with official Nurburgring driving certification was indeed driving the SS V ute on track, but advised not to read too much into the car’s presence in Europe as a sign of possible export plans to the region. Continuing to consist of the sedan, Sportwagon and the ute body styles, the VF SSV trim level will continue to use the same 6.0 liter V8 engine seen on the VE. By contrast, the otherwise identical (but left-hand-drive) Chevy SS performance sedan will make use of GM’s 6.2 liter V8 (LS3). In addition, the the entire VF range will utilize aluminum hoods to decrease weight and increase fuel economy, but only the sedan will have an aluminum trunk lid. What’s more, all VF models will utilize an electro-mechanical power steering setup, switching away from the hydraulic mechanical system. The changeover will reportedly conserve 0.1L/100km (or 0.23 MPG). Holden will officially launch its VF Commodore in June. In sedan form only, the VF will be exported in limited quantities to North America as the Chevy SS. As of this writing, GM-Holden has no plans to export the updated Commodore to Germany, but may (or may not) sell the vehicle in limited numbers in the United Kingdom as a Vauxhall. Next story Car Clash: 2014 Camaro Z/28 Or 2014 C7 Corvette Stingray? Hope it will continue to be sold in the UK as a Vauxhall. Keep hoping GM will bring these to US as El Camino. Sure I’ll be disappointed. What came first El Camino or the Ute? El Camino can’t be anymore of a niche vehicle than Cadillac CTS wagon, no? I’d take one of these over a Silverado any day! @thehofinator the difference is that the CTS-V wagon has a significantly lower (sales unit volume) break even point thanks to its astronomic profit margins. That’s not the case for non-luxury mainstream cars like the Commodore/Ute. Ute came first. This type of vehicle was invented in Australia by Ford Australia. Holden then perfected it. Ute came first (around 1934) to El Camino (around 1959). Make mine a six speed!! !